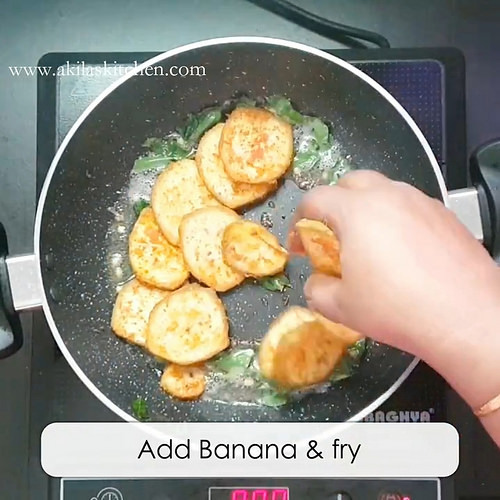 Vaazhaikkai varuval | Raw Banana fry recipe using step by step pictures and video for your easy understanding. There are different types of Vaazhaikkai varuval | raw banana fry recipe all over India. 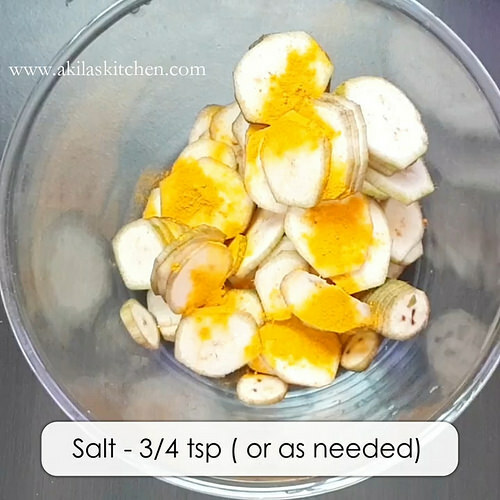 This is a simple Raw banana fry recipe which can be easily made in just 20 minutes of time. 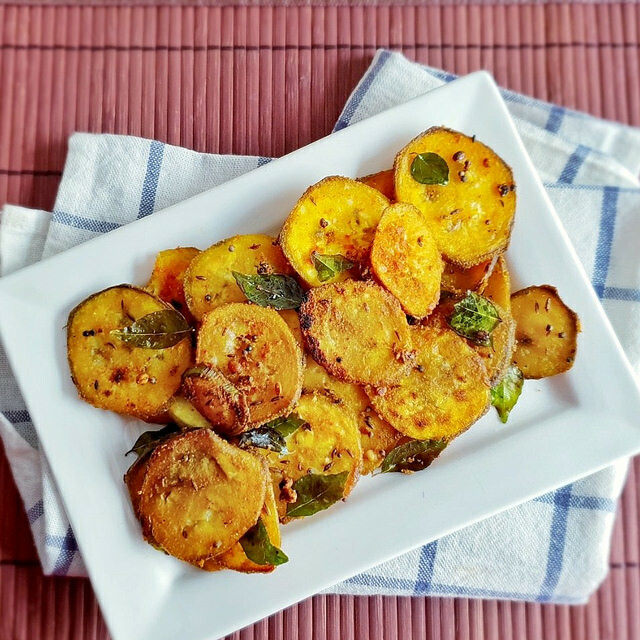 I already posted one Vaazhaikkai varuval recipe in this blog which is slightly varies from this. As Already mentioned, raw banana fry goes very well with sambar rice, curd rice Etc. There are lots of varieties of banana fry which we will see one by one in the coming posts. 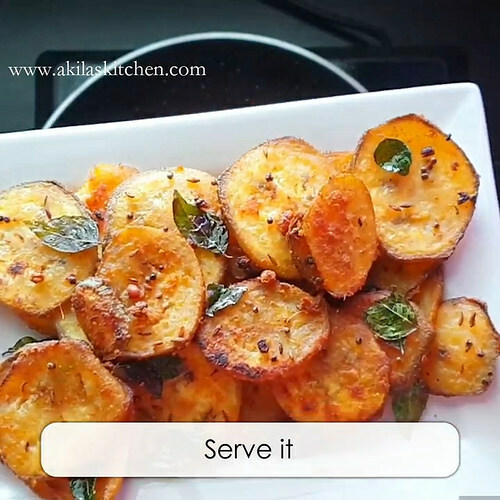 Now let us see the simple form of Vaazhaikkai varuval |Raw Banana Fry recipe. Peel the skin of raw banana using a peeler or a knife. Wash and cut them into Circles of medium size. (Neither too thick nor too thin.) ( Check note 1). So that it gets cooked evenly. 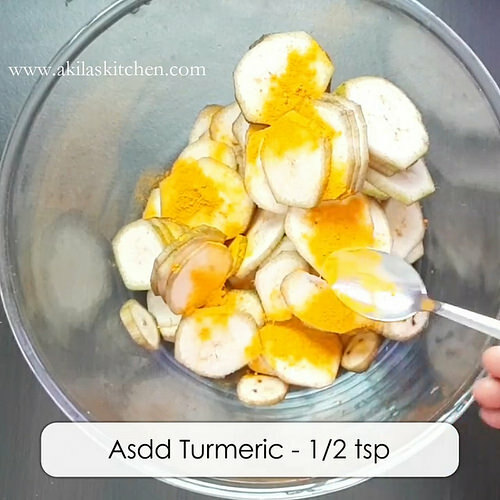 Now transfer them to a bowl and add the chili powder, coriander powder, turmeric, salt and mix them by sprinkling little water, so that Masala coats well. Now add the rice flour and again mix well. Let them rest for 10 to 15 minutes. 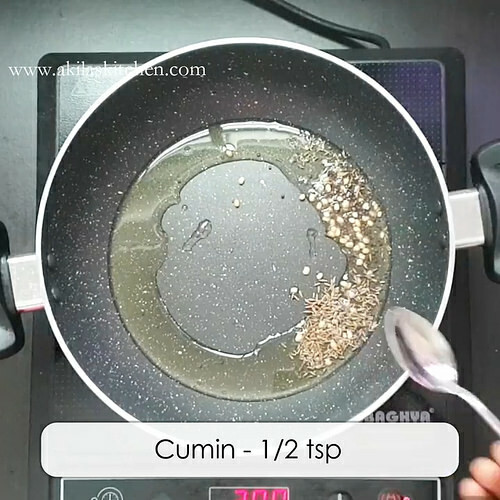 In a heavy bottom pan, add oil and when it is hot, add mustard seeds, urud dal and cumin seeds. Fry for a minute. When mustard splitters, and the curry leaves and again fry for a while. Now add the banana and start frying them. 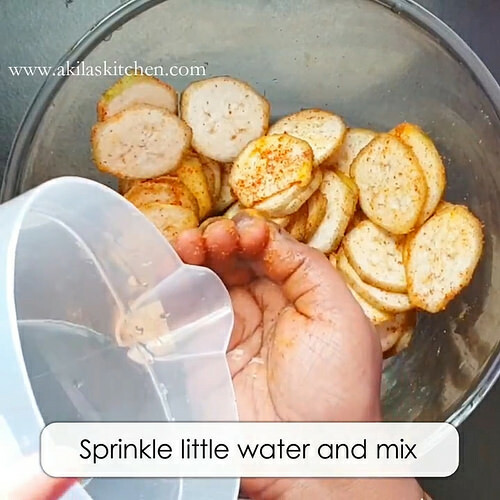 Sprinkle little water for banana to cook. Cover and cook for 5 min. 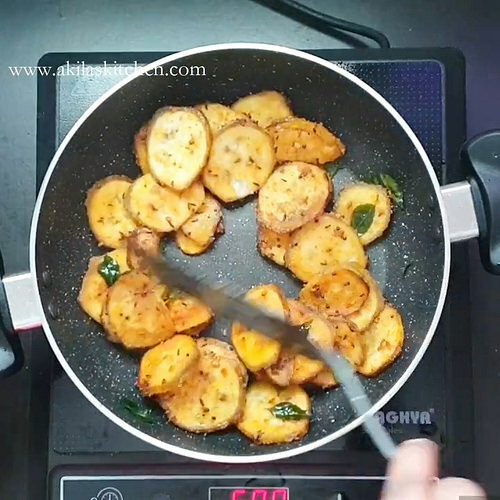 If needed, add one more tablespoon of oil and fry them again. 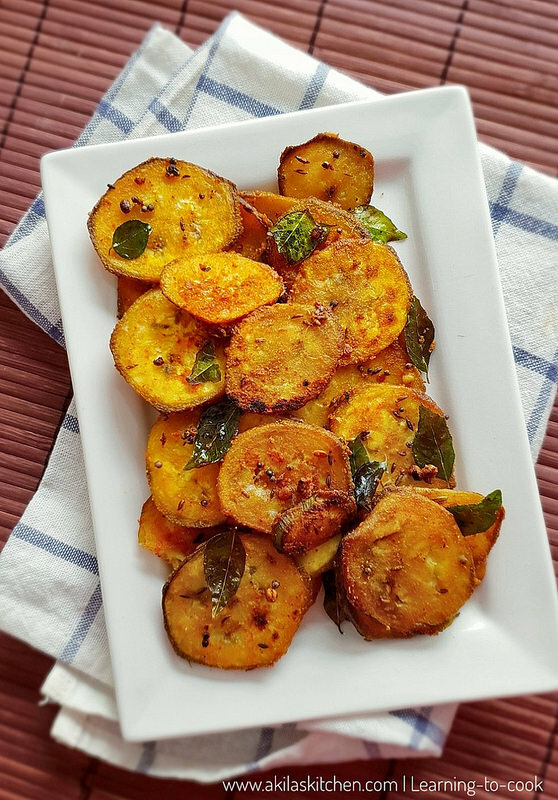 Serve them with hot sambar rice. 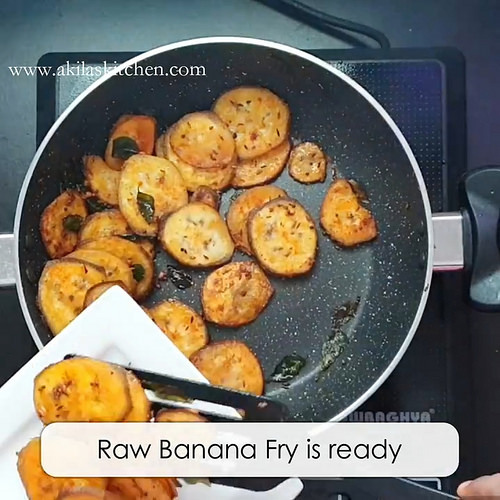 Vaazhaikkai varuval | Raw Banana Fry is ready. 1. 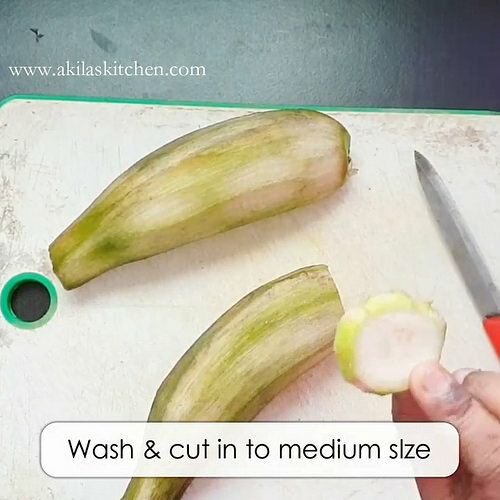 Peel the skin of raw banana using a peeler or a knife. 2. Wash and cut them into Circles of medium size. (Neither too thick nor too thin.) ( Check note 1). So that it gets cooked evenly. 3. Now transfer them to a bowl. 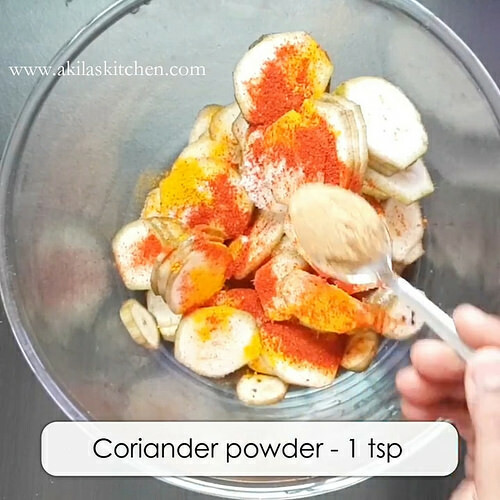 4. add the chili powder, coriander powder, turmeric, salt and mix them by sprinkling little water, so that Masala coats well. 4. Now add the rice flour and again mix well. 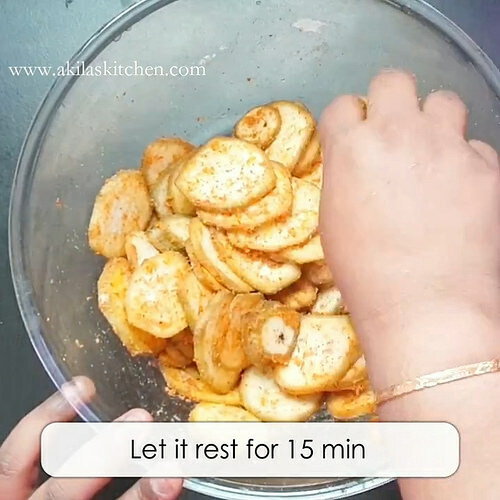 Let them rest for 10 to 15 minutes. 5. 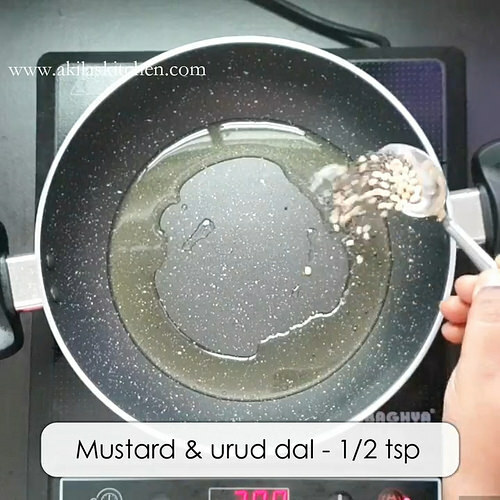 In a heavy bottom pan, add oil and when it is hot, add mustard seeds, urud dal and cumin seeds. Fry for a minute. 6. 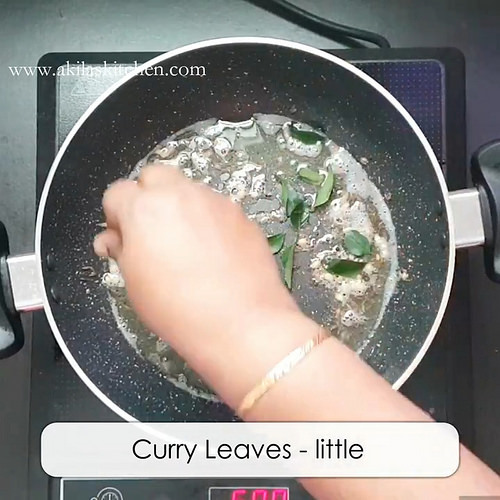 When mustard splitters, and the curry leaves and again fry for a while. 7. Now add the banana and start frying them. 8. Sprinkle little water for banana to cook. 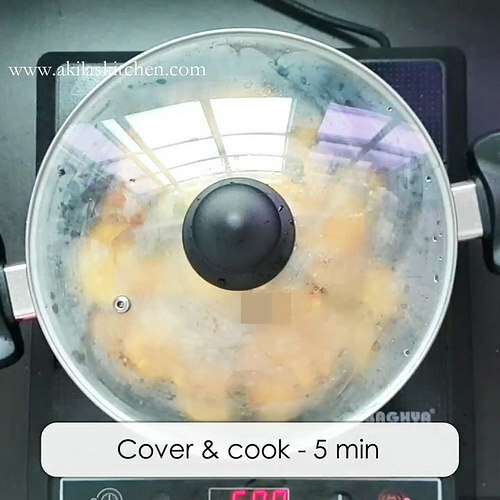 Cover and cook for 5 min. 9. 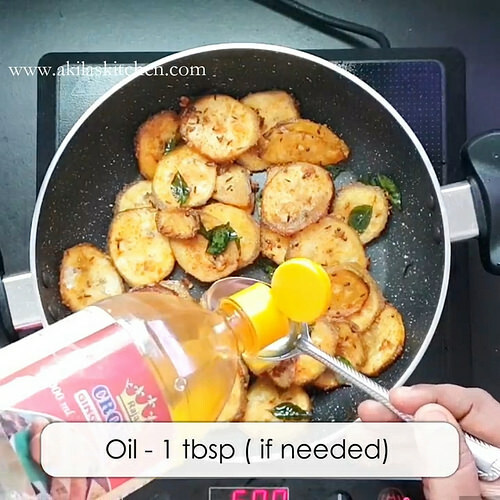 If needed, add one more tablespoon of oil and fry them again. 10. 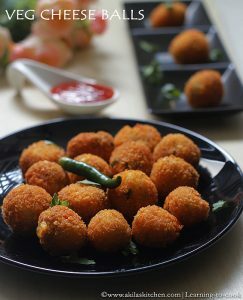 Serve them with hot sambar rice. 1. Banana tends to get black color easily so it is advisable to soak the banana in water or in buttermilk to retain the white color. 2. 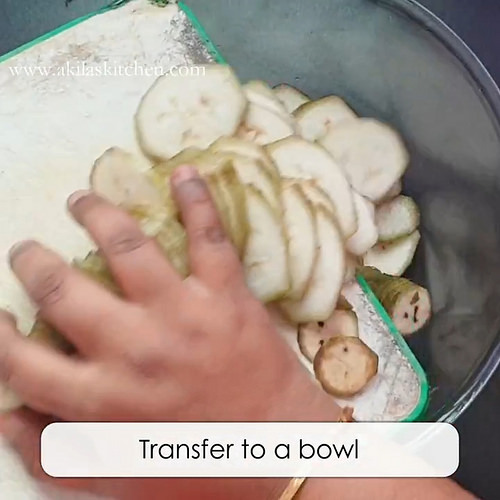 When adding water to the banana add little water so that the banana gets cooked nicely. Do not Add more water to the bananas because the banana might over cooked and it might break. 3. 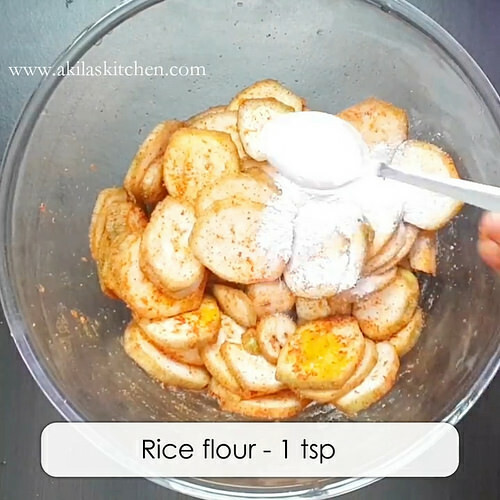 Instead of rice flour some people add gram flour. So you can try adding any of these flours. 4. 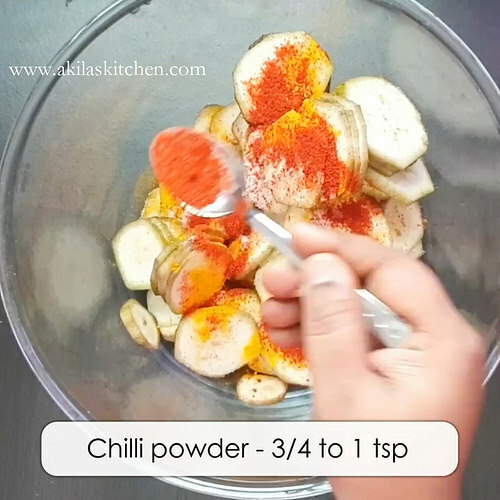 If you want more spicy, you can add 1/2 tsp of pepper powder.